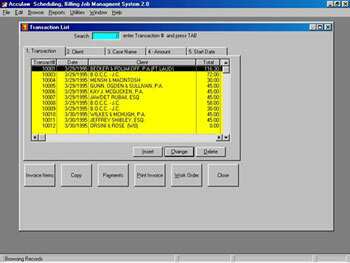 This is Acculaw, Inc new Scheduling, Billing, Job Management Software, based on the original Acculaw program. Now as a web based program with Microsoft Cloud enabling your agency to access the software through the internet like your email or online banking. Our business logic flow from this system comes from 27 years of providing customer support to court reporting agencies throughout the world. See how modern a court reporting office operates. All new and existing customers require training. All existing customers, most into their 2nd decade with us will only receive enhancements. The Acculaw Court Reporters Billing, Scheduling, Job Management system, hereafter referred to as ABSMS, is designed to provide an easy- to-use, powerful, procedure-based application capable of handling the functions normally associated with scheduling, job management and accounts receivable functions in any size court reporting agency. The system can accommodate unlimited records such as reporters, services, jobs, transactions and reimbursements dependent only on hardware storage capabilities. ABSMS provides all the necessary tools for maintaining information on all aspects of the management process, from initial scheduling through final settlement of a bill. ABSMS also provides an extensive array of search and report capabilities that allow easy access to all the data in the system. Produce specific job announcements and pay status to reporters. Produce invoice and shipping labels addressed to clients. Answer all questions within seconds pertaining to schedule, invoice and job status. Obtain receivable and payment information for any date range. Obtain total receivable and payment information for each client. Produce past-due re-bills and/or client statements. Produce reports on jobs that are due in at office or clients place of business. Produce aging receivables report for calling in past-dues. Click Here to see various reports in different categories. We are currently supporting hundreds of court reporting firms nationwide with different operating systems.